Click Here for Enrollment or Call (650) 323-4374 now for more information! You can feel good about sending your child to Sunbeam Day Care Home in East Palo Alto, California.. Going back to work can be a traumatic time for mother and child. At Sunbeam Day Care Home, we seek to ease your transition as best as possible. 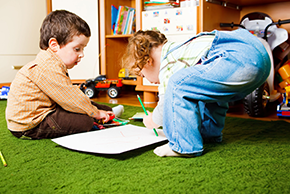 We make the transition easier for your child by hosting the daycare in a home environment. When you leave your child with us, you can feel secure knowing that he or she is safe with experienced caregivers. We provide the quality child care you need while you're at work during the week. Sunbeam Day Care Home has been in business for 29 years, and is still going strong. You can rest assured that you are leaving your child with experienced caregivers. When it comes to ensuring the safety of your child, we have taken every precaution imaginable. Nobody joins our caregiver crew without a thorough background check. We are certified and licensed by the State of California and by the City of East Palo Alto. Sunbeam Day Care Home is also 100% insured. We are approved for up to 14 children at a time. Our staff is CPR certified and fully qualified to care for your children. We pride ourselves in securing a bright future for your child through teaching with patience and encouragement. We will play close attention to your child's intellectual development. They will be praised for the areas they excel in, and will be given special attention for the areas that they might struggle in. We encourage children to embrace their individual personalities and to express themselves through whichever medium they prefer. Maybe your child prefers to express him or herself through painting, or through building blocks. Either way, we encourage them to improve their skills.